VQ Nutrition: What's the Deal with Nuts? Plant Sterols- May reduce the risk for heart disease by blocking the absorption of cholesterol within the small intestine. What types of nuts are best to consume? When compared in nutrient content most nuts are relatively similar. Although some nuts may contain slightly more or less in one or two nutrient categories, they are all nutrient dense. Just be sure when consuming nuts to choose raw and keep portions to about 100 calories or 12-15 nuts for a snack. When choosing nut butters, only purchase the ones with just nuts and salt if you choose. The processed nut butters can contain unhealthy fats and sugars. Read labels to make sure, even organic nut butters can have added sugar. If you like roasted nuts, purchase them raw and then roast at home. The commercial roasting process exposes nuts to oxidation, mold and other toxins. Did you know that peanuts are actually not nuts? They are actually termed as a legume which is an edible seed that grows in a type of pod. Peanuts are not as healthy as nuts, so try sticking to almonds, pecans, walnuts, etc. Add in the avocado oil, fresh herbs and salt. Mix everything well to coat. 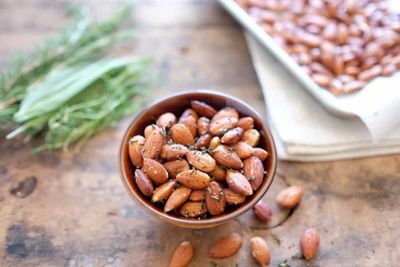 Spread the almonds out evenly on a baking sheet lined with parchment paper. Cook for 10 minutes. Allow to cool for a few minutes and enjoy your snack!